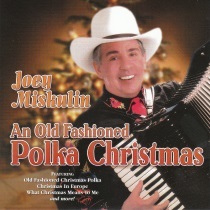 International Polka Music Hall of Fame® Joey Miskulin performs Instrumental Accordion Christmas Music! Remember: Free Shipping is available throughout USA! International Polka Music Hall of Fame® Joey Miskulin presents "An Old Fashioned Polka Christmas". Accordion Great Joey Miskulin presents fantastic Christmas Instrumentals on this fine CD. Check out this CD today!